The May Hillsborough County Transportation Policy Leadership Group (PLG) meeting was held last Wednesday and the Eye was there. The Tampa Bay Times reported Thursday on the major unanimous vote taken by this group: Hillsborough elected officials approve larger transit role for HART. The Tribune, it appears, never even reported on the PLG meeting at all. However, Saturday's Tribune included an editorial Revamped HART would give transportation directions on a subject they never even reported on. That certainly is a way to get their own opinion out without allowing readers to read any "objective" reporting on the subject. So what really happened at that meeting and what is this restructuring really all about? We will differ with Commissioner Sharpe. This restructuring and repurposing of HART is a "hostile takeover" of the existing sovereign HART board. The PLG voted on this restructuring and repurposing with ZERO public input. NO public comment was available before the PLG voted. While the HART board knew of the proposal, this vote was done by the PLG before even allowing discussion and public comment be made before the existing HART board. The PLG has not publicly brought forward any plan of their proposed transportation solutions. Yet they vote on this new restructured HART governance model before anyone, at least in the public, has seen any plan. Does this behavior reflect a transplant or a hostile takeover to push a plan the PLG knows about but not the public? Back to the proposed restructuring and repurposing of HART. County Administrator Mike Merrill stated at the meeting this proposal is recommended because it is the "path of least resistance". Keeping the two gubernatorial appointees helps the "path of least resistance". However, these two appointees will be outnumbered 10-2 by elected commissioners and mayors so their influence will be totally diluted. The proposed restructuring re-purposes HART under a new name, Hillsborough Transportation Authority, to serve a broader transportation mission that supposedly will more highly integrate public mass transit and roadways. Merrill must know about a plan that hasn't been made public yet because he stated that there would be an initial thrust for BRT than "evolve" to rail. We're not sure what kind of BRT he meant. We also heard Mayor Buckhorn say that on rail "we're going to get it done". Therefore the rationale for re-purposing HART is because HART can receive federal tax dollars for transit projects. We get it. The restructured, politicized HART will be sitting in line to feed at the trough of the dwindling federal gas tax bucket. But that federal gas tax bucket the federal Highway Trust Fund is bankrupt. We have witnessed how well this fund has been managed over the last decades - pork barrel projects, gas taxes diverted to high cost rail projects and other non-road projects and bridges to nowhere. No surprises the fund is out of money. The days of getting large federal grants for transit boondoggles may be over. According to Merrill, the HART board change can be made without any state level approval and HART already has the appointment powers for elected officials to appoint themselves to the HART Board. What about the re-purposing of HART? Can the Board simply appoint themselves, dissolve the old board and then change the charter for the new board? Is that legal? Does the public have any say? The current charter that created HART states it's purpose is for "mass transit" facilities and to service the mass transit needs of Hillsborough County. We highlight the word NEEDS is used, NOT WANTS. There is no mention of roads, economic development or transit-oriented development. Manage an Opportunity Fund to take advantage of Transit-Oriented Development (TOD) through Public-Private Partnerships. The elected officials are already very busy and have full plates as it is. I have been to numerous HART board meetings. I applaud and know the time and effort the existing board members put into their duties to ensure they have all the right information, ask the right questions and deliberate to make the right decision. Our elected officials are extremely busy with the duties they currently have with their elected office, overseeing huge budgets as well as sitting on numerous other boards and agencies. The county commissioners also make up the entire Environmental Protection Commission (EPC). Is it even possible to think that they could have the same focus, time and due diligence needed to manage this new expanded mission? If they cannot provide the same or higher level of focus and attention as the current Board members do to this expanded mission, the elected officials will rely on others - aides or staff which increases the influence and power of unelected and non-appointed bureaucrats. Commissioner Sharpe made a somewhat snickering remark at Wednesday's meeting about Philip Hale, the HART CEO who took over after the defeat of the 2010 referendum and just recently retired. However, it was Hale who righted the ship after the 2010 debacle and he had the vision to implement the successful, cost-effective MetroRapid BRT in less than year and under budget. As a result, HART returned millions of tax dollars to the county. In comparison, cost overruns for rail projects average 45%. A buzz word around transit is "choice" riders. The mass transportation market—its riders and potential riders—comprises two broad groups, captive riders and choice riders. Captive transit riders must rely on mass transit; they do not have an alternative way to travel for some or all of their trips because an automobile is required but none is available or because they cannot drive or cannot afford an automobile. Choice riders use transit if it provides service superior to that of their principal alternative, usually the automobile (emphasis mine). To meet the needs of captive riders, broad coverage of the region, the day, and the week is desired. Choice riders are more likely to consider transit for work trips to dense employment centers during peak periods. Commissioner Murman asked what will it take to get those "choice" riders and get people out of their cars? The fact is after all the billions have been spent on transit, it's still a small percentage on average 2-5% who use transit. We like our cars. That's why LA County, that has ever transit mode possible, timed ALL their traffic lights - to get more throughput on their existing roads. Here's a recent article from the Tampa Bay Business Journal about our local commute times. The important question is how much would it cost to provide transit for "choice" riders because our commute times are reasonable, we don't have density, we do have dispersed work centers and we still must provide service to those riders who need public transit because they do not have ANY other alternative. The recent survey reflects almost 72% do not use public transit at all. Survey question: How often do you take public transit? Perhaps that's why Commissioner Beckner stated that we need a "cultural shift to get the public to take transit". Really? Is a build transit and they will come attitude fiscally responsible when the first priority needs to be our roads? The apparent goal of a restructured HART is to go after more tax dollars so the new board made up of almost all elected official will be overseeing a new big bucket of tax dollars, including some "Opportunity Fund" for TOD (development around transit stations). Where are those funds coming from? Our transportation solutions will now be based on political decisions which may not always be in the best interest of the taxpayers who will be paying. A politicized board rather than a sovereign board serves to enable cronyism and corruption. Will we see the deep pocketed Tampa Bay "rail cartel" gain more influence as they pad the pockets of our politicians? Perhaps the Boards new name should be the "incumbent protection board" as we start to watch campaign monies flowing into the politicians wallets. Is that why instead of eliminating the PTC, this group wants to move the PTC under this new board structure? The PTC's cronyism can fit right in and then they all can share in the benefits from the taxi company donations. Every survey indicates the highest priority is our roads and that Hillsborough County has a critical funding gap to maintain our existing road infrastructure. We don't need a restructured, politicized HART to fix our roads. We need our elected officials to figure out how we close our road funding gap to fix and maintain our roads NOW. In addition, HART's 10 year Transportation Development Plan, if funded, DOUBLES our bus service in Hillsborough County. We can double our bus service at a fraction of the cost of the Greenlight Pinellas plan costing billions that supposedly will only improve bus service in Pinellas by 65%. We don't need a restructured, politicized HART board to improve our bus service. Disney World in Orlando has the third largest bus fleet in the state, behind Miami-Dade and Duval (Jacksonville) counties. They never continued to build out their monorail. Disney's monorail has not been expanded in more than 30 years, despite the construction of two additional theme parks and more than a dozen new resorts. Why? Financial reasons. It did not take Disney long to figure out that buses are a much more cost-effective, efficient and flexible way to move lots of people. Here is a Working Paper comparison of bus vs rail from the CATO Institute that confirms what Disney figured out. We were in Las Vegas a few weeks ago. 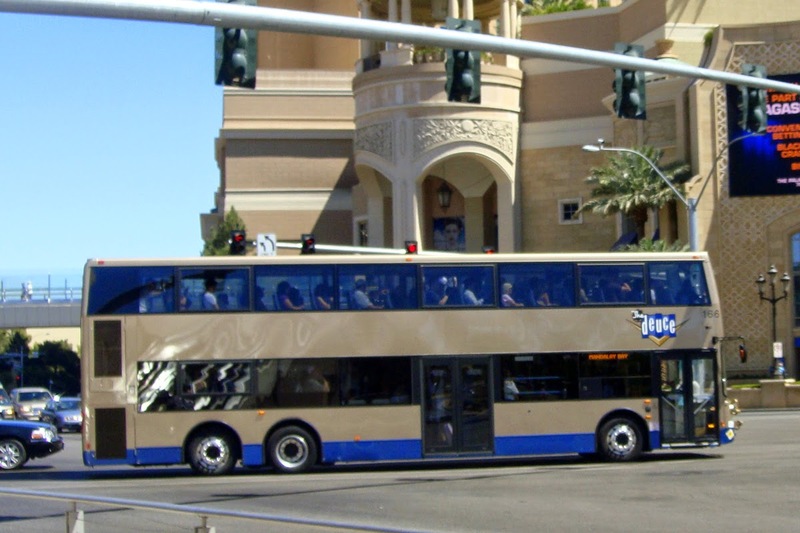 We saw their double decker bus express routes being heavily used up and down the Strip. We also saw their bankrupt and costly ($654 million for just 4.4 miles—almost $150 million per mile) monorail running empty. One of our taxi drivers was telling us about their monorail debacle and that taxpayers may have to bail it out. Merrill did mention a 2016 referendum and he stated this new politicized board needs to be in place by the end of this year to get ready for the referendum. We'll watch that closely. Any future referendum(s) should be single issue initiatives that stand on their own financial merits, expire in 10 years or less so that taxpayers can decide whether the initiative was successful, implemented what was promised and decide to extend it or not. The warning signal should be this. When the government takes your tax dollars for comprehensive plans and the "something for everyone" strategy, the results end up costing more and getting less than what was promised. What happens time and time and time again when politicians get large buckets of money to oversee? What happened the last time Hillsborough County Commissioners, the accountable governing body, got a new bucket of tax dollars to manage with our Community Investment tax? They blew it. They blew out what was supposed to be a 30 year revenue stream in 12 years. STOP talking about high cost trains. My God, it's scary to think that this thoroughly incompetent nonsense came from an actual HART board member, You should resign immediately, because it's obvious you don't know what the hell you are talking about. What a disgrace. Is that a supposed to be a joke? You don't even know what you're talking about. None of the authors of this blog have anything to do with HART. Which one is Sharon Calvert? I'll help you out also with the definition of "Hostile Takeover": take over without the approval of the board of directors. Was this ever taken up or voted on by the HART Board? No. What's nonsense is you making false accusations as it is very publicly apparent you don't know who is on the HART Board or what you are talking about. And cursing adds to your apparent ignorance.